St. Patrick Day Cross Stitch FINISHED. Unframed. Handmade Embroidery. NOTE: if you are interested in buying the pattern only and not the finished piece, please contact me directly! 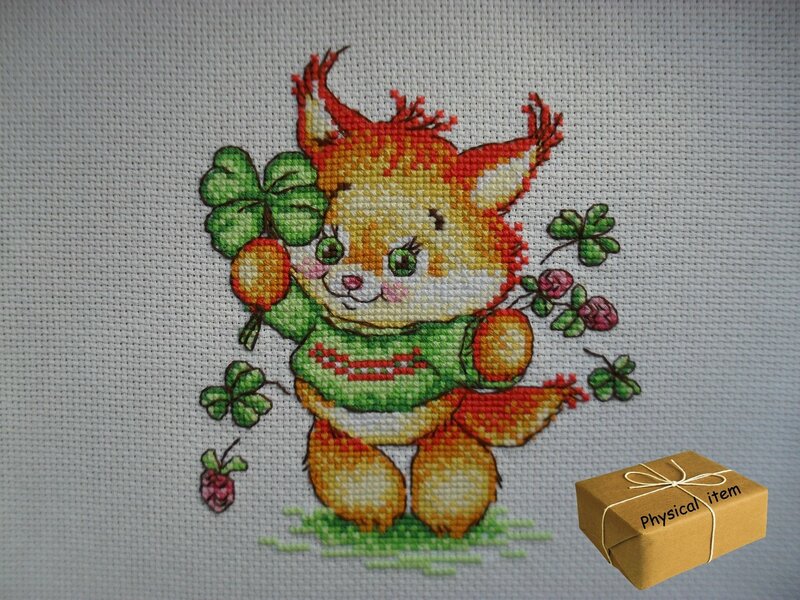 This happy cute little fox wearing a colorful knitted sweater would make a perfect constant spirit-riser for you! I absolutely love it! While stitching, I felt totally happy, merry and peaceful))) The motif is just wonderful! It is cross stitched on 14 count white cotton/linen Aida fabric with DMC 100% cotton embroidery floss (11 colors). The stitches are all even and stitched in one direction. The item is washed and steam-ironed. Please, note: the item is UNFRAMED! Only 1 piece is available! Please NOTE: if this item is made to order (Custom Order was requested), it will take 7 working days to be ready and 1-2 working days to be processed and shipped. We discuss all the matters first (terms and conditions, pre-pay %, shipping costs, etc. ), then I create your personal listing in our store, make your personal item, send you the photos, you pay for the item, I send the item to you. That’s it!